Discipline 2014 new collection features three new projects by Lars Beller Fjetland, young and rising design talent and the winner of Designer of the Year at the Norwegian Elle Decoration Award 2013. First one on the row is Maya, a small flat-pack coffee table with and oak base and a travertine stone tabletop. The Touchwood chair is an all-wooden stacking chair with a friendly and familiar appearance. Its harmonious and natural colour palette of the dyed ash wood, reflects different moods and emotions without stealing too much attention; a chameleon adding value, comfort and beauty to its surroundings. After his big success with the Re-Turned birds, Lars has been busy playing with the leftover materials obtained from the production of the Discipline collection. 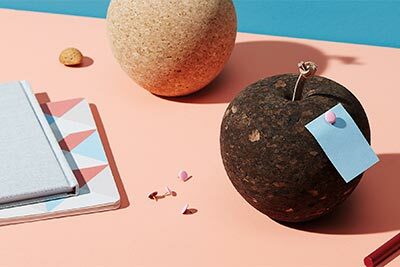 The result is Pomme, an apple-shaped object made of cork and leather, which can be used as paper holder or pincushion for notes and messages.